The 2017 Chevrolet Tahoe is two years into its current iteration, and it benefits from constant updates in this hotly contested marketplace. The top-line LTZ trim becomes Premier, following along with the rest of the Chevrolet lineup's migration. Additionally new technology helps remind drivers to check the back seats for infants or pets before exiting the vehicle. Forever a Chevy Tahoe driver! I love my Tahoe. It is the second one I have owned, the heated seats make every cold morning ok! The most interesting thing I have found in this particular model is the area in the stereo place that slides up with a touch of a button. You can stash things inside and no one would be the wiser. I use it to hold all my sunglasses. But if I valet my car, I would put valuables in there, because it looks like its built-in when closed. It took me months to even figure out it was there! I do wish the back seats were heated though - kids would enjoy that! I love the fold-down 3rd row. Currently I have my dog crates back there, but I can easily take them out if I need to use the 3rd row. I love how the back hatch has its own window that opens, so I can load big things inside & hang them out the window, or just open it for the dogs. The feel of the engine when driving is amazing. It feels strong & capable of anything. It grips the road - my car has automatic 4WD so I do not have to think about it, if the road conditions get bad, the car automatically kicks in the 4WD and I am safe! I always let babysitters use my car when driving the kids around, because I know they are safe in the big, sturdy Tahoe. I love my Tahoe! 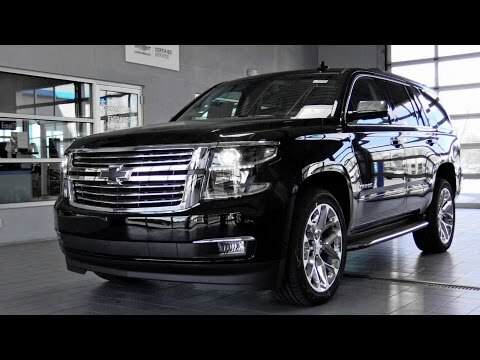 2017 Chevrolet Tahoe nothing but issues. I have always driven Chevrolets, however this last Tahoe I bought I have had one issue after another, mostly cosmetic. My main issue is the gear shifting sensors are misfiring and the dealership cannot figure out how to fix it. I can be sitting at a red light and my engine basically stalls. If I am driving while it happens, my Tahoe jerks uncontrollably as if I were driving a standard and didn't know how. Dealership's only response is, we cannot figure it out, so just bring it back in if it happens again. They keep my vehicle for up to 5 days sometimes. Bigger is better. I have the room I want and the comfort. This vehicle is spacious and comfortable. I has great handling ability and in my opinion a very safe vehicle to drive. It seats five and has a large storage space in the back. But the back seats lay down flat so you have a huge amount of storage space. It gets better gas mileage than I would have thought considering the size. I like the feeling of sitting a bit higher than most other vehicles on the road, that gives me the ability to see more than just the car in front of me. Plus, its a Chevy.